I (Tom Coghill) was first introduce to Dr. Kelly’s cancer protocol when I was introduced to Dr. Jaimie Dy-Liaco in St. Theodore’s Hospital of Sagada. 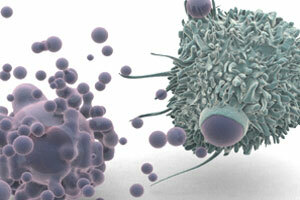 We were treating disease conditions with great success but advanced cancer was resistant to juice therapy and fasting. One terminal cancer patient diagnosed with prostate and bone cancer who could not urninate without great difficulty or walk with out help went home to live an active life for one year where after the cancer returned and took his life. Juice fasting in cancer therapy had some consistent results: reduced pain and inflammation, a period of decreased tumor mass and increase wellbeing but angiogenesis continued, the proliferation of bloods vessels to supply nutrient to the tumor. That led myself and Dr. Clare Lawlet to being open to new forms of cancer treatment. Waldo Peck,age 83, a resident of Chicago, USA, had requested cancer treatment for a sarcoma on his thigh. This treatment would be directed by Jamie in the hosptial. Through a combination of bloodroot applied to the tumor, raw pig pancreas and a raw food diet with fresh juices, Waldo is now regaining the use of his leg and is cancer free and is presently living in Sagada. On further investigation into treatment using the Kelly protocol, I discover a long history indicating it is almost 100% effective in cancer treatment. This key ingredient of treatment is raw pork pancreas take about 14 times per day in small amounts. It is my belief that this therapy would be even more effective with juice fasting rather than a raw food diet. I have included Dr. Kelley’s book for you to read. Over a twenty-five year period, Dr. William Donald Kelley, a dentist by training, developed a complex approach to treating many chronic and degenerative diseases, including cancer. The three main elements of his metabolic program are nutrition, detoxification, and supplements of pancreatic enzymes. Although the controversial Kansas-born practitioner was condemned as a charlatan by the orthodox medical establishment, thousands of severely ill patients sought his advice and followed his program, many with reported good results. Today, a number of practitioners claim to be using the Kelley regimen, though whether they actually are is open to question. 1. Nicholas James Gonzalez, M.D., One Man Alone: An Investigation of Nutrition, Cancer, and William Donald Kelley, unpublished manuscript, 1987. 2. Robert G. Houston, Misinformation From OTA on Unconventional Cancer Treatments, invited review for the U.S. Congress, Office of Technology Assessment (Otho, IA: People Against Cancer, 1990), p. 10. 3. Harold Ladas, “Book Review,” Cancer Victors Journal, Summer-Fall 1988, pp. 23-24. 4. Interview in Healthview Newsletter, vol. 1, no. 5, 1976, pp. 4, 10. 5. For a review of these enzyme studies, see Max Wolf, M.D., and Karl Ransberger, Ph.D., Enzyme Therapy (Los Angeles: Regent House, 1972), pp. 135-146. 6. William Donald Kelley, One Answer to Cancer (Winthrop, WA: Wedgestone Press, 1974). 7. Cancer Forum, vol. 3, no. 5-6 1980; and interview with the author. 8. Gonzalez, op. cit., pp. 71-72. 9. Robert W. Maver, “Nutrition and Cancer: The Gonzalez Study,” On the Risk, vol. 7, no. 2, 1991, originally published in Discoveries in Medicine, Mutual Benefit Life. Dr. Kelley’s Answer to Cancer (combining One Answer to Cancer, by Donald Kelley, and Metabolic Ecology, by Fred Rohe), Wedgestone Press (Winthrop, Washington), 1986. Out of print; check your local library. The New Approach to Cancer, by Cameron Stauth, English Brothers Press (New York), 1982. Out of print; available from the Cancer Control Society (see page xv for address and phone number). Contains a good deal of information on metabolic therapies and the case histories of twenty cancer survivors who followed a Kelley-type program. One Man Alone: An Investigation of Nutrition, Cancer, and William Donald Kelley, written and distributed by Nicholas James Gonzalez, M.D. (see above for address and phone number), 1987. Unpublished manuscript. Includes a biographical profile of Kelley, a detailed explanation of his system, and an analysis of fifty case histories documented with hospital and patient records. Cancer Forum. Back issues of this magazine have numerous articles and case histories.